Made with authentic details and scatter-wound winding. The pickups scatter wound using enamelled copper wire AWG42. This set is on the photo, Alexander Pribora hand wound pickups. The pickups are sold without covers. Fit the standard cover Fender american 52mm. 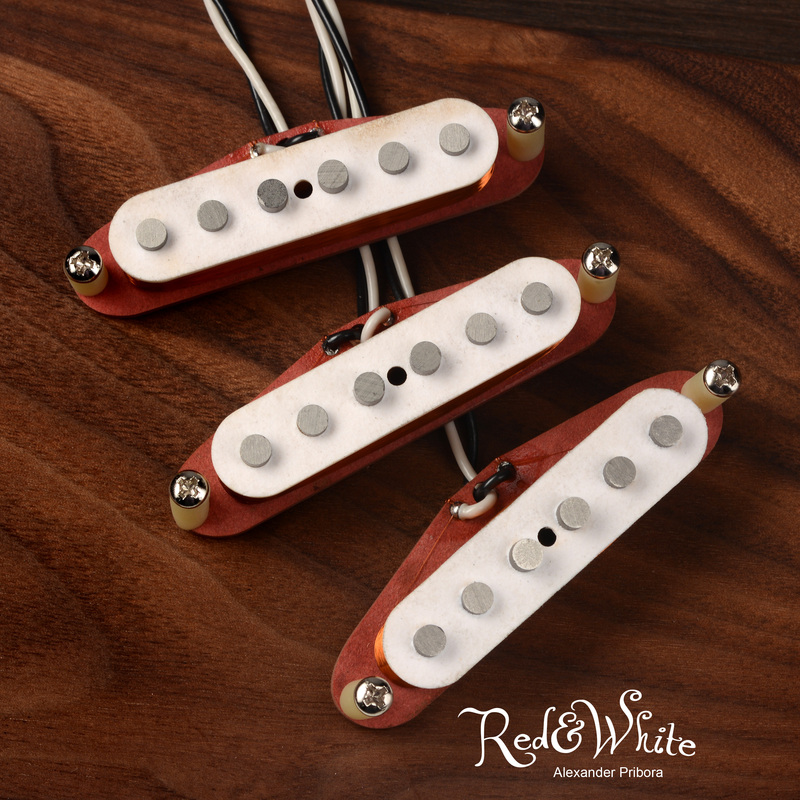 Single coil is made of red and white vulcanized fiber and staggered alnico V magnets. Additionally glued and varnished. Glue eliminates the possibility of detaching the flatwork from the magnets, and the varnish adds additional structural strength and prevents electrical shorting wire on the magnets. I’ve bought this set of pickups from a guy who resell various rare pickups in Malaysia. I’ve bought the Neck and Middle single coils from him only as my guitar has a HSS route, and…I can not be happier. These pickups are great. If I’m gonna describe them in a nutshell I would use the words clarity and tightness. They are so clear sounding, compared to and Fender American stock pickups, have tight and deep bottom end that is almost piano-like, and high end that is clear and airy but not ear-piercing. I’m planning on doing a series mod with a mini toggle to get those hotter bigger sounds, but I would be already happy enough without it. Best value for money ever spend on pickups I would say. These are so good. I put these in my 50s influenced partscaster, and they have not disappointed. All the clarity and sparkle that a strat should have at its best. If you’re shopping for some vintage spec single coils, you can’t go wrong. You can spend triple the money without getting a better set of pickups! This pickups are simply great !! I did not expect so big difference from stock pickups I have on my 1995 standart stratocaster. 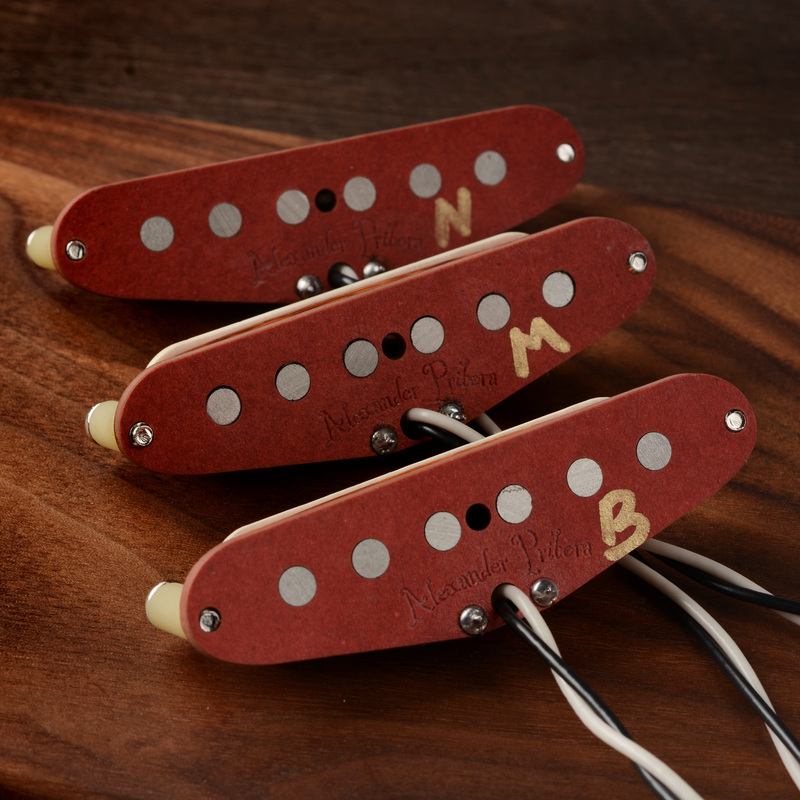 Pickups are much more sensitive for any finger movement, so you will get many more sound variations. Simply to say “guitar has more SOUL”. Other good thing is, the pickups are well coupled together, so I was nicelly suprised with sound of 2nd and 4th position. Now I can say, it is the sound I was looking for. I dont know why is the sound difference so big, but I guess it is due to materials used and care with which the pickups are made. I have noticed that, from the time I have unpacked them from the box. They vere made with love and passion and so they play! These are just great. Very clear, lots of chime, but full and round at the same time – they have a really musical and responsive quality. If you are a “partscaster” like me, these are your pickups. These pups have that beautiful, clear, lonesome sound that I have strived for. I have bought seymours, fender noiseless, you name it. These are miles above the rest. I just ordered the VooDoos for my next. Thank you Mr. Pribora. Che dire… semplicemente stupendi nulla da invidiare a marchi più blasonati e costosi…suono molto vintage e spettacolare. Complimenti. The Red-&-White pickups sound great! I put them in my ’88 Strat+. Full & clear, lots of character in each of the 5 switch positions. I added a parallel blend mod to get a tele middle position sound & that is also really great. Excellent work sir! I ordered the Red and White pickups a few months ago and installed them in a custom built S type guitar that I bought used. The guitar sounded ordinary before I used the Red and Whites. Now it sounds extraordinary. It has that classic chimey strat tone I had been looking for. I am sure Leo would have approved of the sounds that are coming out of my original 65 Princeton now. Keep up the good work.